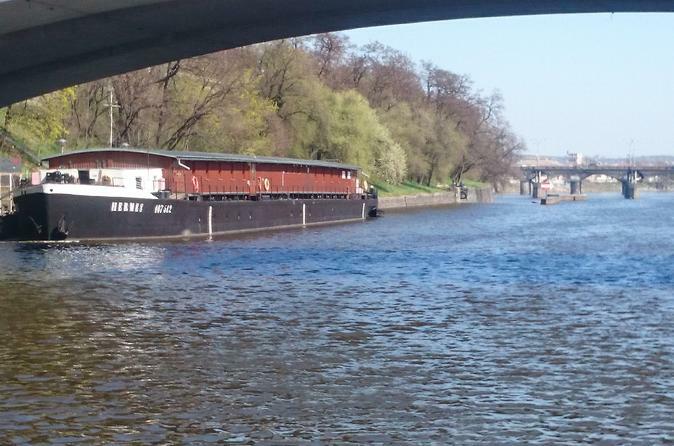 See Prague’s top sights while filling up on traditional Hungarian specialties during this 2-hour lunch cruise. 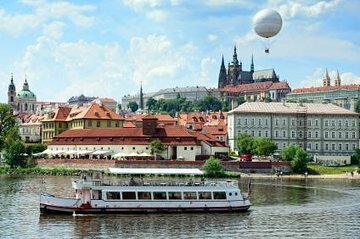 Glide along the Vltava River aboard a climate-controlled riverboat, and see famous landmarks like the Rudolfinium, St Agnes Monastery and Prague Castle. Then, when the time comes, sit down to a delicious buffet lunch, accompanied by onboard music. First of all, the driver who took us to the pier was rudehe didnt seem to like people. Secondly, the cruise is not really that nice...there is not much to see past the old town sights. The food was ok but on the ad, it said there would be live music. There was no live music. And the tour was in sevearl languagessome very loud and screechy in my ears. I didnt think it was worth the money we paid. I found the interpreter to be less than enthusiastic about being there. Also, too many varied countries were on board and the large group of Asians who were not involved in our group did not know etiquette and kept yelling, laughing loudly and chattering the WHOLE time the interpreter was trying to explain to those of us in his group what we were seeing. Less than an enjoyable time. The food was good, but the sight of Prague from the river is not as interesting as some other capitals. very nice and relaxing trip. fortunately we had a nice sunny day, the buffet was great with plenty of food and plenty of choices. the pick up point was easy to find but the return to ur hotel is not provided. We enjoyed the trip. The welcome on board was warm and we were very impressed by the lady who told us a lot about prague and its history. She spoke about 5 languages and I must say in a fluent way. Very impressive and she was most helpful and kind. I can recommend her as a trip leader in every way! 1. We tried to call the number listed to find out about parking. It was 9 AM, nobody answered and the mailbox was full. I sent two emails and neither was replied. 2. We got there 15 mins early and it was rainy and cold. We are in our 70s. We asked if the bus with the driver was ours and was told to wait until called. After 20 cold minutes we were allowed on that very same bus. 3. As we were riding I asked questions and was told, lady I can't answer that until we get on the boat Again he replied, Lady I told you to wait, I've told you too much already. There were only 4 people on that bus and we were together. Later on the boat, I asked a question and was reprimanded for not paying attention! It was he that was not listening before I asked about something else entirely. My sister told him he was rude to which he replied, I know I am. After we found out that we were Americans and not British as he thought, he got friendly. By that time we had been so insulted and ill treated, we just looked at the scenery. Between the four of us, we have travelled to at least 50 countries and have never been treated so rude. We would not recommend your company to any of our friends.